This project will help save auto history! And it will be very entertaining to Society visitors. You may have noticed that we have been touting some neat articles in the Society’s Magazine Archive, in both Social Media or via this Newsletter, but it’s likely that you don’t know the reasoning behind our efforts and the nature of this collection as it relates to the Society’s mission. To many, taking a look at old car magazine articles is an interesting walk down memory lane, but we at the Society have a more important reason in mind for collecting and digitalizing the material. Yes, we are primarily interest in original source material, like brochures, advertisements, factory publications, correspondence, and the like to preserve our automotive history. But there is a whole category of material called “secondary sources” that researchers, writers, educators, and car nuts want to use to put together material on the history of the automobile. As historians and archivists, we at the Society recognize that some of the best “feet on the ground” sources for a “back in the day” look at vehicles are car magazines. After all, these publications were dedicated to telling their readers what the latest automotive trends, plans, and most important, how the vehicles performed in the real world. 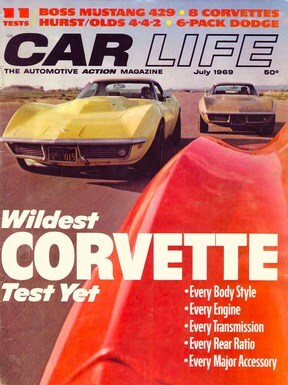 These magazines also had a finger on the pulse of the enthusiast and consumer, and this is always told through reader letters and responses; trend projections, advertisements, race, and other event coverage; and repair or modification questions and articles. We think magazines are the best source for how the various brands and models were perceived back then. Why they are considered secondary sources, however, is that, they might have gotten their facts wrong, they might have even been misled (the most famous case of that being the 1964 Pontiac GTO story in Car and Driver), or they might not have had the latest information when they published. Regardless, they still are a very solid window into the automobile back in the day. That said, we have set up a mission to collect, digitize, and make available to you every single automobile magazine printed from 1946 through turn of the 21st century. That is not to say that we won’t go back earlier or move forward past that date, but the project we’re outlining in this article already encompasses over 25 thousand magazines, 85 thousand articles, and well over one-half million digital images! As a not-for-profit organization dedicated to preserving auto history, we have no desire to collect this material for any sort of re-publication for monetary gain, and we will actively police any attempts to use our Library’s materials for such purposes. We are collecting this information to preserve it, to see that it is not lost, and to make it easily available to historians, researchers, educators and hobbyists, period. Of course, the small volunteer staff we have now can make only a dent in that huge number of magazines, but we are still pretty proud of our current accomplishments. We have already scanned a majority of the material in over a thousand magazines, comprising over four thousand articles and 20 thousand page images! Yes, we are going to need help to expand our future efforts. There is a ton of work involved, including scanning and "clean up" of the material and loading it on the website, but we have a plan for this. This plan involves enlisting the aid of educational institutions with an interest in preserving history to recruit students (for educational credit and perhaps even a small stipend for the work they do) and their teachers in parts of this huge project. Remember, as a library and archive, we have an obligation to deliver copies of the material in as close to original condition as possible. When talking “digital,” this means making the image as close to as it was when printed—and that requires some digital graphics skills. Then there is the work to upload the material as well. At this point we should explain that each article is contained in a PDF file that can be downloaded or just read by merely clicking on the file name, where it will open and be visible to the reader or researcher. As a significant part of this project, we are using a software tool called “optical character recognition” (OCR) to turn each magazine’s Table of Contents into a digital file. This is so that we can make a database of all the articles, their authors, and the year, month and magazine they in which were published. We feel that this part of the project is just as significant as the scanning of the material as it will give researchers, writers, historians, and educators a means to quickly find material that will help in their work. Of course, car nuts will have access to this information as well. At this point, we have just enough resources to deliver the magazine and publication date, the cover image, table of contents, and the key articles in that issue. Scanning the entire magazine from cover to cover is just not feasible with the resources we now have. However, each magazine is placed in a specific webpage, and this allows us to use it as a place holder for the inclusion of all the remaining material from cover to cover. Second, we have revamped the way we display the magazine to include a “thumbnail” of the lead page(s) of each article in the magazine along with the article title and the PDF file. As part of that display, we have included the Table of Contents in digital image form as well as a listing of all of the articles found in the description of the magazine. Click HERE to see an example. This change in approach requires us to go back through all the magazines we’ve loaded and add in these thumbnails and the TOC descriptors. It also requires us to take a bit more time with new material we are loading, but it is well worth the effort. Third, we have developed a plan and proposal to approach various educational institutions in an effort to convince them to assist us in this project. We will have more to report on our success in this effort at the end of the first quarter of 2015. If you are an educator, college administrator, or department head and may be interested in the project, please e-mail our Society President at eric.white@ahpsoc.org. Fourth, we are soliciting donations from businesses and enthusiasts with an interest in the project to help sponsor the effort, as the project will have real and tangible costs. But for those of you who may want to read the materials we already have on hand, just click HERE to take a look around. We are “under construction” in that we have some material in the new format and some in the old, but you can still access it. Whatever you choose to do or whatever your interest in the magazines is, we hope you enjoy this project! and downloadable as PDF files.